GLOW Stones USA pigments in the Sand or Powder formations provide you the option of introducing glow in crevices and other small areas. Also ideal as a topcoat treatment on existing concrete, tile, etc. For use only with solvent based, clear fluids. DO NOT allow contact with any water or expose to high humidity. Powder pigment is available in a waterproof version, for use with water-based sealers and in high humidity conditions. Our products need two things: light so they can ‘charge’ and darkness so you can see their GLOW. If you have a project that can offer these two things, then you have found what you need to make your project amazing! CAUTION: Pigment powder is extremely fine and creates a dust when pouring. Please use in well ventilated area; pour close to your surface to minimize dust, and wear a protective dust mask. DO NOT use metal mixing tools or allow pigment to come in contact with metals while mixing or applying. DO NOT over-mix. Turn in gently, scraping sides often. DO NOT expose to moisture or water unless using the waterproof powder pigment. DO PRIMER COAT all surfaces before applying glow mixture. Allow to dry before applying glow mixture. DO COAT roller with clear epoxy first. A dry roller will hold onto more pigment particles. 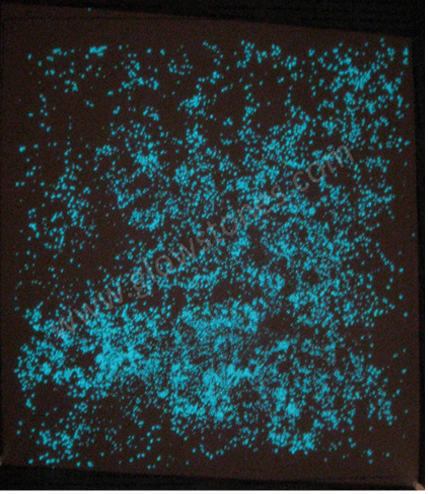 EFFECTIVENESS of glow will be affected by the color of the treated surface. Darker colors will absorb glow, while lighter colors will reflect and enhance the glow. Calculate density of coverage or mix to accommodate this. For maximum effect, prime with white paint. TEST a small area of your project surface to identify the desired ratio of pigment to epoxy. See “Calculating Needed Quantities for Your Project” section below for more information.APPLY ONLY to clean, dry surfaces. UV protection is now a standard feature on epoxies and sealers. Its purpose is to stop the fluid from yellowing over time. The UV blocker will not affect the glow because our products absorb all types of light. UV is the fastest light source, so plan on a slightly longer “charge” time; about 45 minutes to two hours for all-night glow, just to be sure. Testing your epoxy product with the pigment will tell you how much time your mix needs. For the best glow visibility in complete darkness, a high gloss white primer is required to achieve full luminance. For visibility in normal lighted conditions, a high gloss yellow primer is required. Solvent based sealers will last longer than water based sealers, but are less environmentally friendly. CAUTION: This powder is extremely fine and creates a dust when pouring. Please use in well ventilated area and wear a protective dust mask. Standard product is for use ONLY with solvent (oil/alkyd) based solutions. Available in waterproof form, for use with water based solutions. Sand pigment can ONLY be used with solvent/oil/alkyd based solutions. It is not offered in a waterproof version. Mix carefully, as the Sand is soft and can break down to smaller pieces with too much friction applied. Sand is ideal for filling crevices and pits, such as with a salt-finish concrete. The larger particles provide a varied look compared to the fine powder. Deep Blue is a smaller size grain, with the Green and Aqua providing a larger grain size. The pictures below show 2 oz. of Sand pigment in 1 square foot. This density of coverage is a starting point, and your needs may indicate adjusting the quantity up or down. The amount of epoxy used will vary with the number of layers you use. In general, you should expect to use about 1.5 to 2 times the quantity of epoxy that your calculations indicate. For instance, if the coverage instructions for your epoxy indicate that 1 gallon will cover 100 sq. ft. then you can plan on using about 1-1/2 to 2 gallons of epoxy or sealer with about 12.5 lbs. or 200 oz. (5.68 kg.) of pigment, based on our standard density of glow calculations. Multiply your square feet by .125 (the level of coverage for 2 oz. per square foot). This is your needed pounds. Because the methods of application and conditions are beyond our control, GLOW Stones USA makes no guarantee or warranty concerning the use or results to be obtained from use of the described products. Any such warranty of merchantability is disclaimed. Buyer is solely responsible for results. We strongly recommend testing before use. We are here to support you in this process in any way we can.